The International Women and/in Musical Leadership Conference took place at Senate House in London between Thursday 7 and Saturday 9 March. The conference was co-chaired by Laura Hamer, Open University Staff Tutor in Music, and Helen Julia Minors of Kingston University. The conference, which attracted delegates from over 20 countries from all over the word, was a great success. It included keynote addresses from Jenni Roditi and Katherine Dienes-Williams; a roundtable featuring Alice Farnham, Emma Haughton, and Sarah MacDonald; and two evening concerts at Club Inégales. Open University Music was well represented. PhD student Sarah Clarke presented her research on Augusta Hervey; PhD student Ann Grindley did a fantastic job throughout the event as a Conference Assistant; AA100 AL Anne-Marie Beaumont (who is also a Senior Lecturer in Music at Wolverhampton University) presented a paper on her experience and practice-based research as a female leader of a Ceílí Band at a British University; and Head of Music Byron Dueck chaired a panel dedicated to ethnomusicological approaches. The conference attracted considerable attention in the Paraguayan press, including this article in Última Horais, one of the main newspapers in Paraguay, and others here, here, and here. 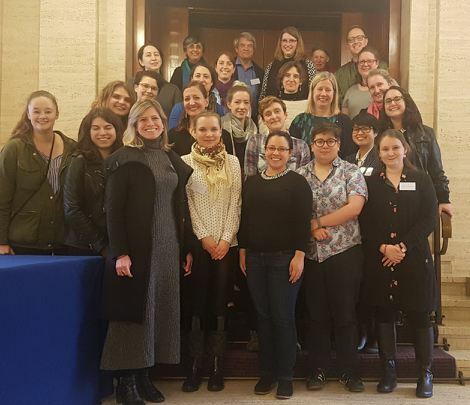 The International Women and/in Musical Leadership Conference was generously supported by the Open University, Institute for Musical Research, and Royal Musical Association. This entry was posted in Events, Research and tagged International Women and/in Musical Leadership Conference, Laura Hamer, research. Bookmark the permalink.